It’s presumed there’s safety in numbers on a hike. But the tragedy at Yosemite last week demonstrates that there can be danger in numbers, too. While every additional hiker on an outing improves the chances that bears and mountain lions will be scared away, they also dramatically increase the chances for human folly to foul things up. Enforce zero tolerance for antics that get people killed. 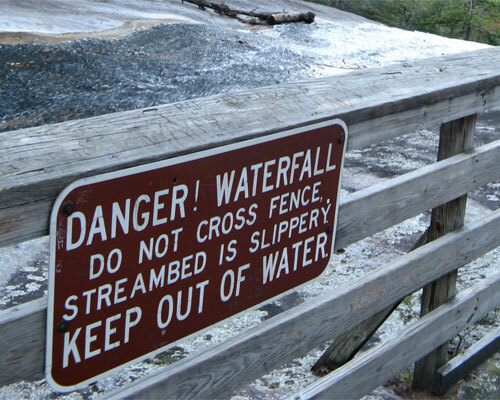 That means you’re the first one to the waterfall and you emphatically insist that everybody obey the warning signs. If there are younger, faster hikers in the group, deploy a trusted lieutenant to keep up with them. Make sure you know the route by heart. I went on a group hike once where the leader said “let’s see what’s down this way” but didn’t know what was down there. We all got lost and the rookies among us had a real scare. Frightened rookies are particularly prone to fatal stupidity. Assume you’re on your own. Because you are. Picture this: you head off into the bush to pee, take a wrong turn and end up on another trail that looks just like the one you were on. But it’s going north and your group’s heading south. In 15 minutes you’ve gone three-quarters of a mile from where you left the group, which is now 1.5 miles from you. How screwed are you if you’ve got no map or any idea of the layout of the local terrain? Take responsibility for the safety of your fellow hikers. Grab people’s arms before they stray off a cliff; yell at them to get back on the safe side of the barrier. Ignore peer pressure. If something’s outside your comfort level, it’s OK to sit it out. You don’t have to join in if you think it’s too dangerous. These are just the most obvious tips. What do you do to keep a group hike safe? Backpacking: solo or in a group. On my backpacking trips I’m always the one with the map yelling at everyone to stop every 30 minutes and make sure we agree on the direction, and to take a water break. Mainly this is for wilderness only trails, where it’s never obvious which trail is the main one and if there’s a trail at all. In Linville one winter 2 years ago we got lost at least 10 times one day but never strayed too far because we always had a group huddle over the map. Never had trouble losing the AT haha. Excellent advice! But guess what? In another month, or it might be a year, we’re gonna hear all about the next victim of his or her own hubris. . .guaranteed. . .btw, good op ed piece by Phil Bronstein on the cruel judgments of our likes criticizing “stupid” people who die: read it at http://www.sfgate.com/cgi-bin/article.cgi?f=/c/a/2011/07/25/EDVU1KDSBE.DTL. . .it generated over 1000 comments, not sure how the hoi polloi divided up in terms of vociferously declared opinions to the contrary….. I do a lot of things, like planning, planning, and planning, but a few others stand out. When you are leading, choose challenges well inside your capabilities. Pushing the edge while leading is for professionals, not for you and me. Don’t be afraid to remove people from the crew if they don’t have the maturity or the skills to be safe. Some people aren’t ready. Maybe they’ll be ready next year. If they show up in jeans and a sweatshirt for a wet and windy campout, they can go home and change. Safety decisions aren’t majority rule, they are single veto. If one person thinks the risk is too high, do something else. Getting into swift water, even without a waterfall, is one of the most dangerous things a hiker can do. Never split up. There is no “fast group” and “slow group” unless they are completely independent, each with a leader, shelter, food, stove, crew first aid kit and skills, etc. For lots more details, read the “AMC Guide to Outdoor Leadership” by Alex Kosseff. Get the 2nd Edition. Excellent advice, groups of people can be extremely stupid. I’d add that you should be aware of everyone’s abilities in the group and that you should cater for the weakest ability, because ignoring peer pressure is very difficult. A rookie hiker will be nervous and perhaps not want to do something, but they won’t feel like they can speak up and say they don’t want to do it. It is up to the leader to realise these things, assess these things. Thanks for the tips, Alec.